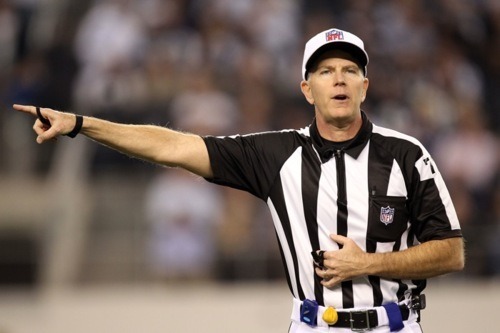 Which NFL Referee Was the Strictest in 2010? Back during the 2010 season, I started charting penalties by referee crew to see if there was any significant and consistent difference in how strict particular referees are, or whether they favor home or away teams. The data I used was just the standard total penalties from each game, and thus it does have some problems. First, 17 weeks is obviously a small sample size. It’s better than one or two games, but we will still need to take a few years to see if the same referees keep popping up. Furthermore, the total penalties don’t account for those that were declined, nor do they break them down into categories by type: holding, roughing the passer, facemask, etc. 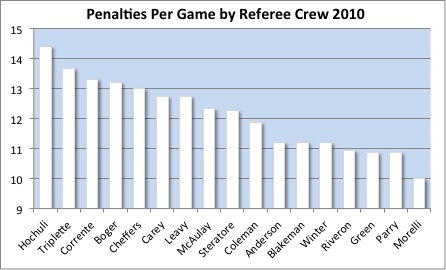 Just like it was most of the way through the season, Ed Hochuli’s crew gave out the most penalties, followed by Jeff Triplette and Tony Corrente’s teams. There’s a three to four penalty gap between those referees and the outlier on the other end, Pete Morelli. Whether that difference is statistically significant is hard to say. Certainly there’s a good deal of variance game-by-game. However, Hochuli’s crew had only three games where they gave out just nine penalties. Refereeing the same teams, Morelli’s group had seven games in which they gave out nine penalties or fewer. It seems likely that somebody’s approaching the rules a little bit differently. 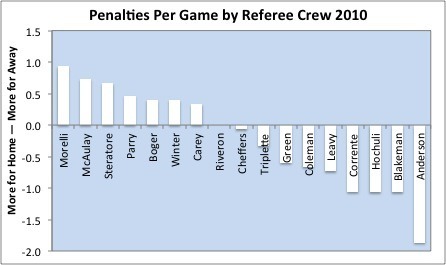 The above graph breaks down the penalties as to whether they were against the home or away team. This data was more volatile when I added in the final few games, but overall the trend is similar to the previous version. Some referees, like Walt Anderson, penalized one side on average much more heavily than the other. The reality is that we can’t tell for certain, using these numbers, whether any one of these referees is particularly biased or is unfairly enforcing or ignoring the rules. But the graphs do at least pose the question. When we see a football game turn on a single call by a referee, it’s tough not to conclude that a few extra violations called or disregarded can have a big difference. Tagged with NFL, 2010, Referees, Penalties, Average, Ed Hochuli, Walt Anderson, Pete Morelli, Jeff Triplette, Tony Corrente, Statistics, Graphs, Per Game, Bias. May 5, 2011 by Brian Solomon.